and a tickle-y under there! 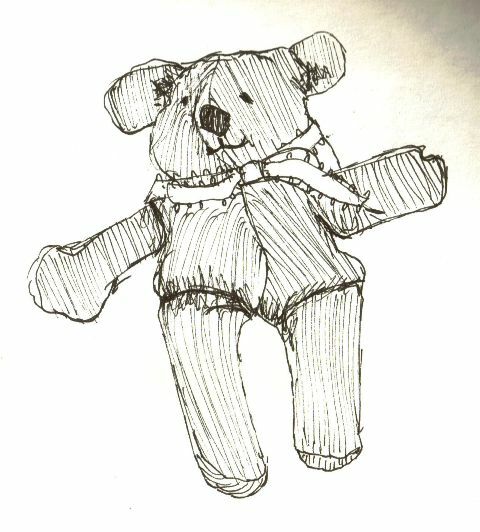 This is a little pen and ink sketch of a tiny hand-made teddy bear that I was given before I went overseas on my first backpacking adventure. He was made from brown mini-corduroy, with a lemon, loop-edged ribbon and was filled with small beans/beads. Perfect for travel; he could fit in the smallest of spaces and didn’t speak a word. I can see a children’s book potential here. Maybe I can leave that up to you? Something along the lines of him wanting to be a famour bear artist when he grows up? ?